Another New Year, another set of writing resolutions. How’d you make out with them last year? If you are like many people, those shiny resolutions wore off pretty quickly, and by now, you are probably back to making all the same excuses you made to put off writing that you’ve been making every year. So this year, instead of writing an article about setting goals and resolutions, or giving you more writing tips, we thought we’d do something a little different. Let’s recognize and celebrate our excuses for what they are. 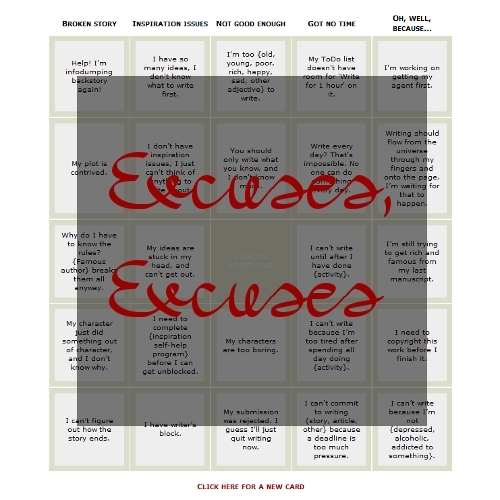 To that end, we’ve created the Writer’s Excuse Bingo card, an interactive excuse finder. Click here to play Writer’s Excuse Bingo. When you hear one of the excuses on the card coming out of your mouth, or whispering in your brain, click the box. See how long it takes you to call out BINGO! Or go to the Pen In Each Hand exercise for guidelines on turning your excuses into writing opportunities. Free Space isn’t exactly free: You need to write something, even if it’s only a word or two, to be able to play it. You can download the Writer’s Excuse Bingo to play offline by saving the file (File menu, Save Page As…) to your computer and opening the saved file in your browser. No internet connection needed to play or get a new card, but you do of course need a connection to follow any of the handy Toasted Cheese links we also provide on the page. And if you don’t like our excuses, you can go into the saved html file and edit the code to provide your own. Use a simple text editor or code editor like Notepad++. (Word and similarly complicated editors tend to add a lot of junk to html files.) Just change the text in the quotes inside the excuse arrays in the script provided. If you mess something up beyond fixing, you can always download a new card file. Enjoy, and may it keep you writing! I’ve been writing this article inactively for about two months. Actively, I’ve been working on it for two solid weeks. I’m not going to finish it. I’m going to miss my deadline and let everyone down. Or, I could stop now and cut my losses and write about how I’m not writing this article. I could have, and should have, signed up for and started this article in January. That’s when the editors get together and start prodding each other to come up with ideas. There are many of us, so we can pick and choose when we’d like to work on something. This year, I waited until everyone else had chosen because I couldn’t think of anything I wanted to write about. I should have simply signed up first, then decided on what to do. I would have had months to decide on something, work on something, and polish something. Instead, I stared at a blank page, forcing my writer mind down paths it didn’t want to go simply because I’m out of time. My original topic for this article was choosing simple words and phrases. I have a writer friend who fancies herself a language expert. She has four dictionaries close to hand and uses them all in daily communications such as emails and blogs. Her writing is impossibly complex, archaic, and trouble for anyone without four dictionaries nearby. I decided this would be a great article, passing on the wisdom that most readers will put the book down if they can’t understand it—if reading it is work, not joy. But all I really had to say I could sum up in a few simple words, as evidenced by this one paragraph. I couldn’t think of anything else to say once I’d gotten the basics on the page. The article simply fizzled out. Once you start writing your first draft, don’t stop. Don’t get up and make pancakes, don’t turn the TV on just for a minute, don’t play with the kitten, and leave the email box alone. Writing inspiration is very flighty and it can leave as quickly as it arrived. Sit down and stay down until everything you wanted to say is on the page. This is different from not waiting until the last minute. I had a minor day surgery I needed to have done and it was scheduled just a week before this deadline. Before the surgery, I managed to write two paragraphs and couldn’t get anything else out. I was focused on the event itself and couldn’t see too far beyond it. What I should have done at this point was plan for my failure and ask someone else to write a backup article. They would have been more than happy to help, considering the circumstances. I should have planned a backup article as I planned my ride home from the hospital. If something isn’t working, stop working on it and start working on something that will work. This article is coming to me much easier than the original. I know already that this article is the one that will be printed. The other will go into the ‘archives’ on my computer to wait until the light of inspiration slices through my head and I can finish it. I notice that this article sounds just like me. I am not as concerned with sounding like a “professional” writer as I was in the other. The other article I sounded far away, as if I was writing it from above you somehow, imparting sage advice from the side of the mountain. This time, I sound friendly and personable, frustrated and pained about my writing and myself. I know you’ll all be able to relate to my struggle and my personal issues, so I’m writing it that way. It’s a lot easier to write this time because it’s my voice and not the voice I think you would listen to. I’ve known the other article wasn’t working since I first began actively writing it. I complained about writing it. I complained that I couldn’t think of anything to say. I complained that I was running out of time. I complained in my blog and to friends. One fine friend even told me to write an article about procrastination since my original topic wasn’t working. I didn’t listen to her, or to myself. I simply kept putting off writing at all. Once I did listen, I found I had a complete article. Once this article is edited and put up, I’m going to volunteer for another for next year. I’m going to think long and hard about a topic. I’m going to start early and plan for distractions. I’m going to assign a date to sit down and write a month before the deadline. I’m going to start a draft and finish that draft in one sitting. I’m going to listen to my voice and to my muse. I’m going to meet my deadline. You should be writing. Yes, you read that correctly. You should be writing, not browsing online, checking e-mail, finding little distractions… or should you? Does procrastination have a positive place in a writer’s life? Sure it can, as it can come in handy for anyone. The key to making procrastination into a boon instead of a burden is to use it to improve your work. There are three ways writers procrastinate: doing non-writing activity, doing writing-related activity and doing throwaway writing. Let’s talk briefly about the last way. You may be asking, “isn’t any writing that I do considered ‘good’ writing?” It can be and usually is. If you want to work on your novella and you become engrossed doing a background story that relates to the action, you’re not necessarily doing any throwaway writing. If you start doing a character bio and are inspired to write the emigration of the main character’s great-great-grandmother and get caught up in a sweeping saga of love, loss and liberation, that’s not a productive use of writing time (fun as it may be). Of course, no one’s forcing you to stay with your original idea. Maybe the first idea is boring you and the other one gets your juices flowing. The point is that spending your valuable writing time doing superfluous work might make you feel like you’ve wasted it in the end. I suffer from writing-related procrastination. It doesn’t have to be fiction that I’m dilly-dallying about writing. It could be a blog entry, a letter or, just as an example, an Absolute Blank article. Let’s say I have an idea for an article. I want to get some more information or read other articles on similar topics. I “Google” whatever search terms I like and start working. At least, I call it “working.” I find a good article at a site and decide to see what else is in their archives that might be inspiring. I check out their forums, if they have any. Someone has posted a link. I click the link and go to another writing site. The new site has an archive of articles that I need to look over. It’s research, after all! The circle continues until I recognize what’s happening and either begin writing or tear myself away. One key is to recognize when you go from research into random websurfing. You can set a time limit for research, if that works for you. Alternately, you could try to train yourself to recognize that you have enough research for the time being. If, like me, you enjoy the research, use it to treat yourself. After five days of solid writing, spend a day doing research, organizing your notes or cleaning up your bookmarks. Unless you’re a professional, salaried writer, non-writing activity takes up most of your day. Your job, your classes, your life in general is chock-full already. Where to fit in your passion for creative writing? You can work on your writing any time. I think about plotlines and characters while driving or while drifting off to sleep. I keep a little notebook in my bag to jot down ideas, things to look up, even character names when I’m out. Non-fiction writers can use their day jobs, no matter what they are, for writing inspiration. I got lots of ideas for characters and dialogue while working retail customer service. Finally, you get around to writing. It’s good. You’re chugging right along. It occurs to you to do a word count and you’re over 500! If you were Graham Greene, you could quit. You’re a little bleary-eyed with a stiff back. Knowing you’re a procrastinator, do you dare walk away now that you’re in the groove? Writing is work. Like most any work, it can be physically draining. If you were out gardening and started to get uncomfortable, would you stop and stretch your back? Of course. It doesn’t mean you’ll leave all your equipment out in the elements for days. You’re not going to leave your story open on the computer for days either. Just a quick stand-stretch-squat can get your blood flowing again. If nothing else, flex your fingers and turn your head in every possible direction. Writing is a job and every worker deserves a coffee break or two. You’re intense. When you write, you get absolutely focused. Maybe you’ve just written an emotional and/or critical scene and you need to step back from it. There’s nothing wrong with playing a round of Tetris or catching the end of “The Daily Show.” If you want to stay in writing mode, time this break and return when your head is cleared. You’re distracted. Maybe you are a stronger person than I. You ignored the dirty computer screen and the unkempt pile of character notes. As you write, you notice these little things and you find yourself thinking more about chores than writing. Allow yourself a break to take care of some stuff if it’s distracting you. I keep a timer near the computer for several purposes and this is one (the previously-mentioned round of computer games is another). When the bell dings, back to your seat. You need to edit. You’ve just written gold! Pure gold! Unfortunately it doesn’t mesh with chapter one. Rewrite chapter one. It’s productive work, not writing-related procrastination. You have, ahem, “human needs.” Hunger, thirst, potty break, whatever. Just take care of it and come right back. You can’t concentrate on what you’re writing if you’re thinking about something else. For refreshment breaks, have someone serve you whenever possible. One fun way to keep a writing appointment is to make it on pizza night. What else to do while you wait for delivery? Take that half-hour and churn out a little something creative. You’re done. Maybe the reason you’re stalled in your writing is because you have nothing else to do. You’ve completed the chapter, the poem, the paper, the article or whatever you’ve been slaving over. Now’s the time to send to a friend for a second opinion, post it for some feedback or hand it over to the dutiful one who brought you drinks and let the dog out while you wrote.One tip: never leave off a piece of writing without leaving yourself something new. If you finish a chapter, write a couple lines of the next chapter. The Future You will sit down to work on it, dive right in and feel productive. Now it’s time for me to blow the whistle and send my fellow procrastinators back to work. Get some inspiration from the boards, the calendar or archived exercises and get to work already!